Hip impingement, or Femoroacetabular Impingement (FAI), involves overgrowth on bones that form the hip joint. These “bone spurs” cause abnormal contact which, over time, can damage the joint resulting in pain, immobility, and the development of arthritis. This entity of FAI is a relatively newly-recognized phenomenon–for many years, the cause of these symptoms remained unknown. It’s not uncommon for patients to come to us after seeing other physicians who offered vague explanations and unsuccessful treatment plans. Fortunately, we at Towson Orthopaedic Associates have the knowledge, skill, and technology to treat hip impingement and protect the joint from further damage. 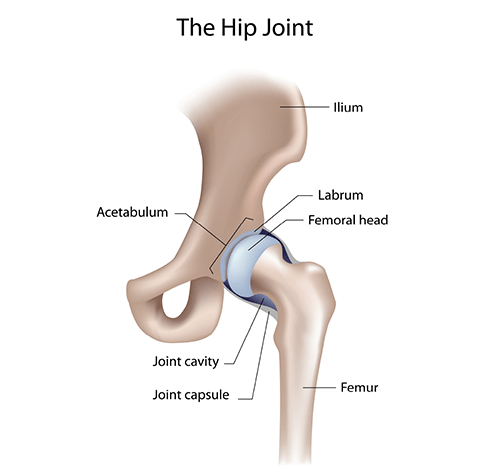 Typically, a healthy hip joint undergoes only modest wear due to minimal friction. The rounded head of the femur (ball) rests relatively deeply in the acetabulum (socket) with curvatures that marry each other perfectly. This provides a conforming structure which dissipates force evenly over a large surface area. Articular cartilage, which coats the ball and the inside of the socket. This cartilage wears away with the development of arthritis. The labrum, a ring of cartilage surrounding the perimeter of the socket which creates a custom seal around the joint, and keeps joint fluid contained between the ball and socket. When the labrum is damaged, the suction seal is lost and the fluid escapes from the interface between the ball and socket. Without the lubrication of joint fluid, increased friction within the joint may lead to early development of arthritis. Normally, the ball of the hip joint tapers down to the neck very abruptly. As you move your leg (such as flexing your hip, bringing your knee toward your chest, or stretching your leg to the side), if the ball doesn’t taper to the neck as quickly as it should, the edge of the ball bangs against the rim of the socket pinching the labrum between them. This is known as impingement of the hip. Since Hip impingement is a developmental condition, it happens for one of two reasons—overgrowth of the rim of the socket (a pincer legion), or overgrowth on the edge of the ball (cam legion). These can occur in isolation or can include abnormalities on both sides. Patients with this abnormal anatomy (Femoroacetabular Impingement anatomy) have a higher risk of developing arthritis in the hip. Often felt in the front of the hip or the groin region, symptoms of hip impingement are often confused by patients as a pulled muscle or hernia. While many people think of hip pain as occurring to the side of the hip towards the buttock area, this is not often the case. Patients suffering from hip impingement often complain of pain when they try to run or do any type of cutting or twisting. When asked where the pain is, most patients circle the entire groin area rather than pointing out a specific location. A common early sign of hip impingement is the development of vague groin pain during exercise and activity. You may notice a stiffness or tightness in the hip or groin region after sitting for a long period of time—such as during a long car ride or flight. This aching pain and stiffness is caused by inflammation or bruising of the labrum. Unfortunately, these symptoms are mistakenly dismissed by many as being inconsequential until pain begins to limit activities. What Happens if Hip Impingement is Left Untreated? Imagine waves crashing into the legs of a pier—the legs weaken more with each wave until, eventually, they collapse. Left untreated, the contact between the ball and socket will continue to weaken the labrum until it tears away from the rim of the socket. If hip impingement goes unrecognized, not only does the labrum peel away from the rim of the socket, the cartilage on the edge of the socket side will also start to peel away from the bone. This “delamination” of the cartilage can lead to the progressive degeneration of the joint. To determine the cause of hip pain, an initial workup is performed including a physical exam, x-ray, and (possibly) an MRI. When impingement is first identified as the source of pain, treatment typically begins with non-operative care including anti-inflammatory medication and physical therapy to strengthen the core muscles of the body and stabilize the pelvis. If the pelvis is rocking and tilting with activities, there’s greater likelihood that the abnormal contact between the ball and the socket will occur. Physical therapy can help stabilize the socket so when you move your hip, the motion only occurs on the femoral side instead of at both the pelvis and femur. For some patients, therapy and anti-inflammatory medication is enough to prevent the abnormal contact and symptoms go away with no further treatment necessary. However, if contact continues to occur, advanced imaging, such as an MRI, is indicated to look at the labrum and determine the extent of damage. If symptoms are significant and non-surgical treatment is unsuccessful, surgical intervention may be recommended to relieve pain and prevent joint degeneration. Using arthroscopic surgery, a minimally-invasive outpatient procedure, excess bone is removed to provide clearance for the labrum. If a pincer legion is present, it’s removed using a procedure called a rim trimming of the acetabulum. If a cam lesion is present, the junction of the femoral head and neck is tapered to its normal contour. This most commonly occurs in the front portion of the hip which is why most patients typically complain of pain when the hip is bent, as in the seated position. Once the excess bone has been removed, the labrum is reattached to the rim of the socket allowing it to heal back to its anatomic position and reestablish the seal of the joint. The edges of the articular cartilage are then stabilized to prevent any further delamination. Following surgery, rehabilitation usually involves approximately 4 weeks of protected weight-bearing on crutches with approximately 3 months of physical therapy. Most patients can get back to full activity within 5-6 months. Arthroscopic hip surgery is a relatively specialized area of joint preservation that has grown in significance over the past 15 years. This cutting-edge treatment requires a very special skill set and, therefore, is not performed by many orthopaedic surgeons. At Towson Orthopaedics’ Joint Preservation Center, our extensively trained arthroscopic surgeons are available to provide relief and prevent further deterioration of the joint utilizing this minimally-invasive procedure. We, at the Joint Preservation Center, understand all patients have different needs and deserve specialized treatment. Contact us today to discover which treatment options are right for you.